The information of each protein discussed in this book in some detail is summarised at the end of each chapter in a Data Sheet, where one can find the most important data of each protein at one glance. Full cross-referencing to protein databases is given and many of the proteins discussed are accompanied by their 3D structure. Attractively presented in full colour, Human Blood Plasma Proteins is an essential atlas of this proteome for anyone working in biochemistry, protein chemistry and proteomics, structural biology, and medicine. 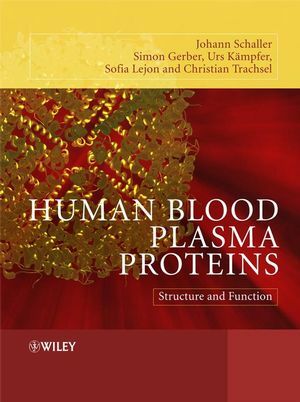 Johann Schaller and Simon Gerber are the authors of Human Blood Plasma Proteins: Structure and Function, published by Wiley. 3.3 Classification of Blood Plasma Proteins. 4 Domains, Motifs and Repeats. 4.2 The Epidermal Growth Factor (EGF)-Like Domain. 4.4 The g-Carboxyglutamic Acid-Rich (Gla) Domain. 4.7 The Fibronectin Type I, the Fibronectin Type II Collagen-Binding and the Fibronectin Type III Domains. 4.8 The Coagulation Factors 5/8 Type C Domain (FA58C). 4.9 The Thrombospondin Type I Repeat (TSP1). 4.10 The VWFA, VWFC and VWFD Domains. 4.12 The LDL-Receptor Class A (LDLRA) and Class B (LDLRB) Domains. 4.13 The C-Terminal Cystine Knot (CTCK) Structure. 4.17 The C-Type Lectin (CTL) Domain. 5.2 Serine Proteases: The Trypsin Family. 5.3 Serine Protease Inhibitors (Serpins). 5.5 The Serum Albumin Family. 5.6 The Pancreatic Trypsin Inhibitor (Kunitz) Family Signature. 5.7 The Kazal Serine Protease Inhibitors Family Signature. 5.8 The Multicopper Oxidase Family. 5.11 The Glucagon/Gastric Inhibitory Polypeptide (GIP)/Secretin/Vasoactive Intestinal Peptide (VIP) Family. 5.12 The Glycoprotein Hormone Family. 5.13 Membrane Attack Complex Components/Perforin Signature (The Complement C6/C7/C8/C9 Family). 5.15 Hormone Families and Signatures. 5.18 Interleukin Families and Signatures. 5.19 The Small Cytokine (Intercrine/Chemokine) Family and Signature. 6.2 Databases for Posttranslational Modifications (PTMs). 7 Blood Coagulation and Fibrinolysis. 7.5 The Regulation of Blood Coagulation and Fibrinolysis. 7.6 The Kinin and Angiotensin/Renin Systems. 8.4 The Terminal Components of the Complement System. 8.5 Components of Complement Activation. 8.6 Regulation of the Complement System. 9.4 Major Histocompatibility Complex (MHC) Proteins. 11.2 Serine Protease Inhibitors (Serpins). 11.3 Blood Coagulation and Fibrinolysis. 12.2 Enzymes in Lipoprotein Metabolism. 12.4 LDL and VLDL Receptors. 12.5 Serum Amyloid A Proteins. 13.5 Hormone-Releasing Factors, Their Trophic Hormones and Related Hormones. 14 Cytokines and Growth Factors. 14.3 Tumour Necrosis Factor Family. 14.6 The Platelet-Derived Growth Factor/Vascular Endothelial Growth Factor Family. 14.7 Transforming Growth Factor-b Family. 15.2 The Serum Albumin Family. 15.4 Iron Transport and Storage. 15.5 Transport of Hormones, Steroids and Vitamins. 15.6 Other Transport Proteins in Plasma. 16.2 Additional Blood Plasma Proteins.